The Maison et Objet collection we love. If you’re anything like us, you’ve been obsessively checking the @maisonetobjet tag on Instagram the whole weekend. Maison et Objet, a design trade show, was held in Paris from January 18 to January 22. Each year, it offers a plethora of style inspo, but among the myriad of colorful Polish furniture and inspiring living room design ideas, one new release stood out. 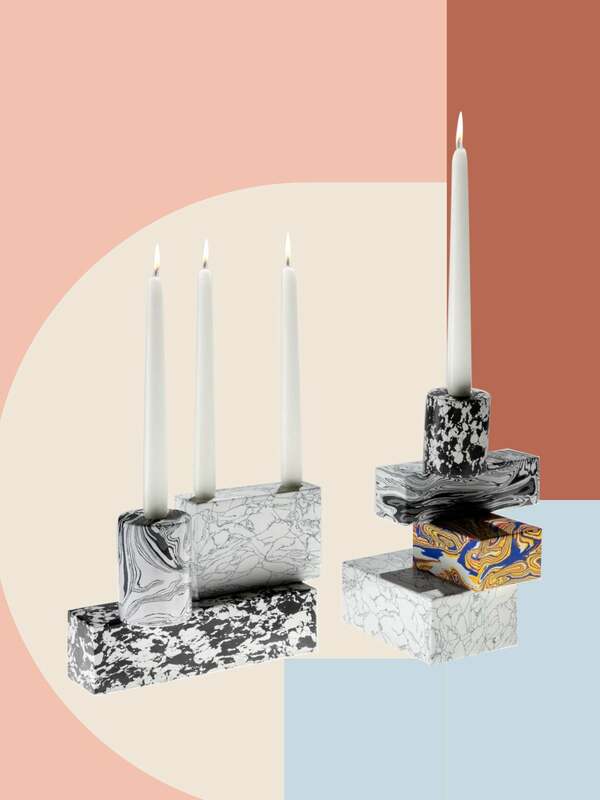 Tom Dixon’s newly unveiled line of marble-patterned pieces is a beautiful collection of tiny sculptures, and we want them all. The “Swirl Series” comprises six items: a group of candleholders, two candelabras, and bookends. Some come in monochromatic colorways, ideal for minimalists on the hunt for a luxe accent piece. Others include a fusion of bold hues, packed together in one undeniably contemporary silhouette for a unique blend of clean lines and messy color combinations that just works. Dixon’s take isn’t the first time we’ve seen swirl patterns in decor. In mid-2018, we noticed the liquid-effect trend take hold, topping the list of an Etsy consumer trend report and seeping into some of our favorite big box retailers’ collections. Dixon’s elevated take seems proof that this trend is here to stay. But as stylish as the swirled pieces are, there’s another element we love even more: sustainability. “[Dixon] takes residue from marble scraps, breaks them down to powder, and then mixes it with pigment, thereby repurposing discarded materials,” explains Romm Perez. Crafted from a heavy material that, according to Dezeen, best resembles 3-D marbled paper, the items are a stylish solution to at least some of the excess created by design. Which could explain his philosophy behind the eco-friendly products he has created. The Swirl Series is about reimagining marble; his much-heralded Delaktig collab with Ikea includes a bed frame made from recycled aluminum. For Dixon, the answer to sustainability doesn’t lie with futuristic, engineered biodegradable materials—it’s in seeing the things we already have in a different light.